Barack and Michelle Obama got an enormous reception after touching down for their annual Martha’s Vineyard vacation this week. When many on the island off of Massachusetts heard that the former president and first lady were having dinner at the Cardboard Box restaurant in Oak Bluffs, hundreds gathered outside the restaurant to catch a glimpse of them leaving. They waved graciously at the crowd as they exited the restaurant, video shows. Almost every year since President Obama took office in 2008, the first family jets off to Martha’s Vineyard for rest, seafood, bike rides and chill days at the beach in August. This is their second visit as private citizens since Barack Obama left office in 2017. It is not clear if daughters Sasha and Malia Obama were also vacationing with their parents this year. Oaks Bluff is an area of the island where African-American elite have traditionally vacationed for decades. “Oak Bluffs…has been called the Black Hamptons, a place where for generations Black people have owned cottages and pastel Victorian houses with wide porches and screen doors that slap in the wind,” the Washington Post reported. 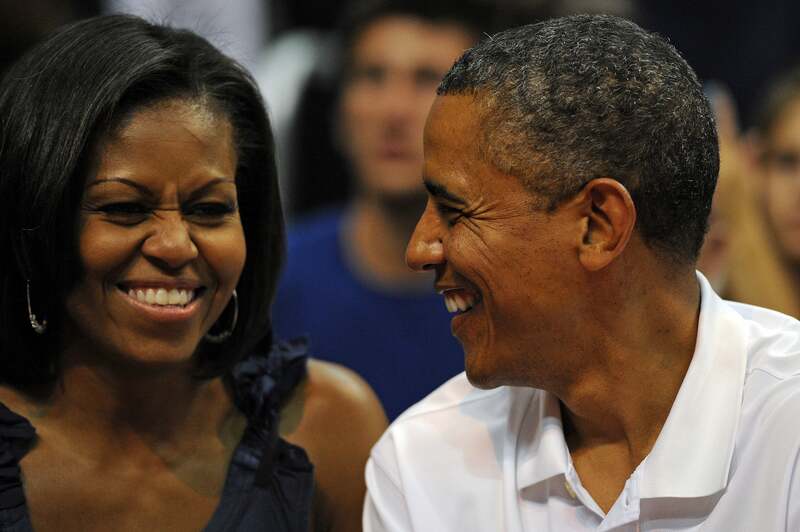 Barack Obama will probably use the time on the island to continue celebrating his 57th birthday, which was Saturday.